Lake Berryessa offers varied paddling opportunities from open water well over a mile from any shore to intimate coves and side-arms. The main lake is about 15 miles long and there are 165 miles of shoreline to explore. These are the main places where there is public access from the road suitable for launching a kayak or canoe. A high resolution Lake Berryessa Paddle Map is available for printing and use while paddling. This map shows the locations of the launch points as well as details of the various coves and islands for exploring. Markley Cove: Several pullouts on Hwy. 128 just above and west of the dam may be used for launching. Carry boats down short trails or gated roads to the water. Pullouts are numbered with small signs and with numbers painted on the edge of the highway. Pullout #13, a short distance east of the store at Markley Resort, offers the most direct but somewhat steep launch access. At the east end of Pullout #10 is a smooth dirt road down to the lake, starting at a gate. This is a longer but less steep alternative. Steele Canyon: A public foot entrance is on Steele Canyon Road just before Steele Park Resort. Kayaks may be lifted over the steel gate next to the foot entrance and then rolled or carried about 1/4 mile along a smooth partially paved road to a side cove of the lake. Capell Cove: The only public boat launch on the Lake. Parking lot and good beach for launching. Parking lot fills up early on Summer weekends. Oak Shores: Lots of parking within the public day use area. Two launch ramps for hand launching of car-topped boats are at Foxtail Flat (short ramp) and Coyote Knolls (longer ramp). Boats may also be carried to the water anywhere within the park. Note closing time for the park when first entering. See the Reclamation Website for further information. Smittle Creek: Easy walk from the parking lot through the picnic area to the water. Pope Creek Bridge: Large parking lot at the intersection of the Knoxville and Pope Canyon Roads. Path down to the water. Putah Creek Pullout: At the north end of the Putah Creek Bridge. Parking with a rough but well used trail down to the water, starting at a foot entrance at the north end of the pullout. Schoolhouse Cove Pullout: Good place to start exploring the north shore. Short path down to the water. Eticuera: The Eticuera Day Use Area is a short distance past the east end of the causeway that crosses the north end of the Lake. This facility offers a parking lot, restroom and a smooth path to carry or wheel a boat to the water for launching. East Shore North: A foot entrance (labelled E1 on the entrance) at the north end of the East Shore road leads to an old smooth road bed. Kayaks may be lifted over the metal gate next to the foot entrance and then carried or rolled on a cart for 0.1 miles to just past a set of posts in the road bed and then launched into a small cove of the lake on the north side of the road. Alternately, kayaks may be launched by continuing to the water at the end of the road bed. See use guidelines and a map for the Lake Berryessa Wildlife Area. Click on the titles below to access the forms, photos and more information. 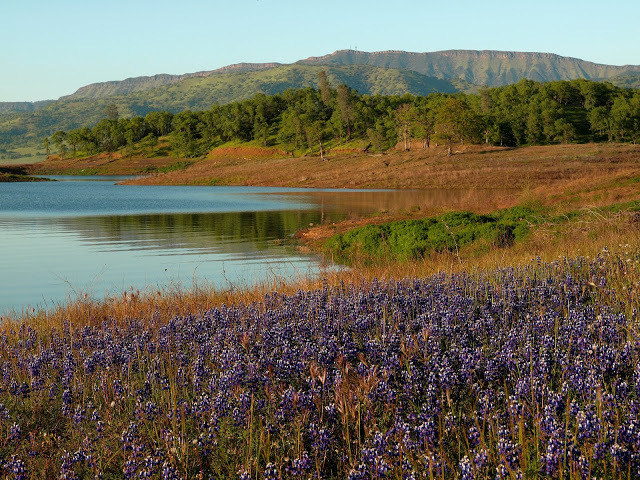 The entire lake is open to paddlers and paddling out in the center is enjoyable with open space and Berryessa Peak and Blue Ridge towering over 2,500 ft. above lake level. The high resolution Lake Berryessa Paddle Map is suitable for printing and is useful for exploring the islands, coves and side arms of the lake. 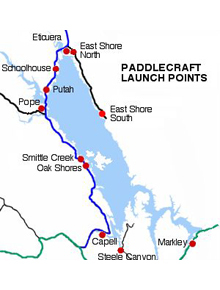 This map shows the launch points and identifies many of the place names in the paddle descriptions below. For paddlers who prefer staying closer to land, here are some interesting paddles along the shores. Refer to the Lake Berryessa Paddle Map for the location of each paddle. Big Island: Launch from Oak Shores or Smittles for a 5 mile paddle around Big Island. The water between the Island and Oak Shores and Smittles is a no-motor-boat area surrounded by no-wake zones. At the east end of the island the paddler is in the center of the lake and yet still close to shore. Explore the various coves. Extend the paddle an extra mile by including Small and Goat Islands. Pope Creek Canyon: Launch from the Pope Creek Bridge. The 2-3 mile paddle up the Canyon takes about an hour one way. The entire canyon is a no-wake zone. Very scenic with large rock outcroppings and steep canyon walls on both sides. Putah Creek Canyon: Launch from the Pope Creek Bridge and paddle into the main lake, north along the shoreline and under the Putah Creek Bridge. Or launch from the Putah Creek Pullout. This arm of the lake extends 6.5 miles from the main lake and is bordered by low but interesting hills on both sides. After the first 2 miles, the remaining 4.5 miles is a no-wake zone. North Shore: This shoreline north of the Putah Creek Bridge is relatively peaceful with coves and small islands to explore. See photo above. The resident flock of White Pelicans is usually seen at the north end of the paddle. Launch from the Putah or Pope Creek launch points or from Eticuera or the East Shore North entrance. Paddling distance between the Putah and Eticuera launch points is 3.5 miles. Eticuera: From the Eticuera Pullout, launch on the north side of the road into this small lake which is separate from the main lake. When the lake is full, the Eticuera Arm extends almost 2 miles. Very scenic and peaceful with large overhanging Oaks and lots of wildlife. Ideal for paddling. The shoreline is private so either stay in your boat or only land on gravel bars within the stream bed.